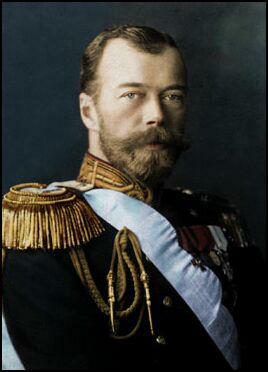 Tsar Nicholas II was supreme command of the Russian Army and was associated with the country's military failures during the First World War. In January 1917, General Aleksandr Krymov returned from the Eastern Front and sought a meeting with Michael Rodzianko, the President of the Duma. Krymov told Rodzianko that the officers and men no longer had faith in Nicholas II and the army was willing to support the Duma if it took control of the government of Russia. The was was having a disastrous impact on the Russian economy. Food was in short supply and this led to rising prices. 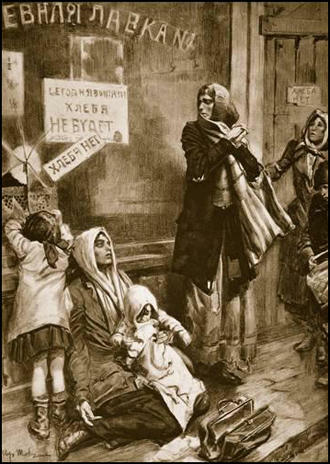 By January 1917 the price of commodities in Petrograd had increased six-fold. In an attempt to increase their wages, industrial workers went on strike and in Petrograd people took to the street demanding food. On 11th February, 1917, a large crowd marched through the streets of Petrograd breaking shop windows and shouting anti-war slogans. Petrograd was a city of 2,700,000 swollen with an influx of of over 393,000 wartime workers. According to Harrison E. Salisbury, in the last ten days of January, the city had received 21 carloads of grain and flour per day instead of the 120 wagons needed to feed the city. Okhrana, the secret police, warned that "with every day the food question becomes more acute and it brings down cursing of the most unbridled kind against anyone who has any connection with food supplies." It was reported that in one demonstration in the streets by the Nevsky Prospect, the women called out to the soldiers, "Comrades, take away your bayonets, join us!". The soldiers hesitated: "They threw swift glances at their own comrades. The next moment one bayonet is slowly raised, is slowly lifted above the shoulders of the approaching demonstrators. There is thunderous applause. The triumphant crowd greeted their brothers clothed in the grey cloaks of the soldiery. The soldiers mixed freely with the demonstrators." On 27th February, 1917, the Volynsky Regiment mutinied and after killing their commanding officer "made common cause with the demonstrators". (Source 2) George Buchanan, the British Ambassador in Russia, went to see the Tsar Nicholas II in January, 1917. I went on to say that there was now a barrier between him and his people, and that if Russia was still united as a nation it was in opposing his present policy. The people, who have rallied so splendidly round their Sovereign on the outbreak of war, had seen how hundreds of thousands of lives had been sacrificed on account of the lack of rifles and munitions; how, owing to the incompetence of the administration there had been a severe food crisis. I next called His Majesty's attention to the attempts being made by the Germans, not only to create dissension between the Allies, but to estrange him from his people. Their agents were everywhere at work. They were pulling the strings, and were using as their unconscious tools those who were in the habit of advising His Majesty as to the choice of his Ministers. They indirectly influenced the Empress through those in her entourage, with the result that, instead of being loved, as she ought to be, Her Majesty was discredited and accused of working in German interests. A mass of women, not all of them workers, flocked to the municipal Duma demanding bread. It was like demanding milk from a he-goat. Red banners appeared in different parts of the city, and inscriptions on them showed that the workers wanted bread, but neither autocracy nor war. Women's Day passed successfully, with enthusiasm and without victims. But what it concealed in itself, no one had guessed even by nightfall. On the following day the movement not only fails to diminish, but doubles. About one half of the industrial workers of Petrograd are on strike on March 9th. The workers come to the factories in the morning; instead of going to work, they hold meetings then begins the procession towards the centre.... Throughout the entire day, crowds of people poured from one part of the city to another.... Around the barracks, sentinels, patrols and lines of soldiers, stood groups of working men and women exchanging friendly words with army men. This was a new stage, due to the growth of the strike and the personal meeting of the worker with the army. Such a stage is inevitable in every revolution. All attention here is concentrated on the food question, which for the moment has become unintelligible. Long queues before the bakers' shops have long been a normal feature of life in the city. Grey bread is now sold instead of white, and cakes are not baked. Crowds wander about the streets, mostly women and boys, with a sprinkling of workmen. Here and there windows are broken and a few bakers' shops looted. The unrest grows; even the monarchist principle is beginning to totter; and those who defend the idea that Russia cannot exist without a Tsar lose the ground under their feet, since the facts of disorganization and lawlessness are manifest. A situation like this cannot last long. I repeat once more - it is impossible to rule the country without paying attention to the voice of the people, without meeting their needs, without a willingness to admit that the people themselves understand their own needs. Terrible things are happening in Petrograd. It has become a real battlefield. Five regiments have joined the revolt. Gunfire never ceases in our part of the city - Liteiny. The officers cannot go into the streets, because the crowd disarms them, molests them, and even kills them.... Worst of all, the soldiers have got hold of the vodka and are drunk. There is bound to be terrible looting of shops, banks and private apartments. The situation is serious. There is anarchy in the capital. The Government is paralysed. Transport, food, and fuel supply are completely disorganised. Universal discontent is increasing. Disorderly firing is going on in the streets. Some troops are firing at each other. It is urgently necessary to entrust a man enjoying the confidence of the country with the formation of a new Government. Delay is impossible. Any tardiness is fatal. I pray God that at this hour the responsibility may not fall upon the Sovereign. Most exciting times. I knew this was coming sooner or later but did not think it would come so quickly... Whole country is wild with joy, waving red flags and singing the Marseillaise. It has surpassed my wildest dreams and I can hardly believe it is true. After two-and-half years of mental suffering and darkness I at last begin to see light. Long live Great Russia who has shown the world the road to freedom. May Germany and England follow in her steps. Petrograd is such that now the Ministers of the Duma would be helpless to do anything against the struggles the Social Democratic Party and members of the Workers Committee. My abdication is necessary... The judgement is that in the name of saving Russia and supporting the Army at the front in calmness it is necessary to decide on this step. I agreed. The Tsar entered the hall. After bowing to everybody, he made a short speech. He said that the welfare of his country, the necessity for putting an end to the Revolution and preventing the horrors of civil war, and of directing all the efforts of the State to the continuation of the struggle with the foe at the front, had determined him to abdicate in favour of his brother, the Grand Duke Michael Alexandrovich. Today, I am addressing you for the last time, my dearly loved armies. I have abdicated for myself and for my son, and I am leaving the throne of the Emperors of Russia.... Much blood has been shed, many efforts have been made, and the hour of victory is approaching when Russia and her Allies will crush, in a common effort, the last attempts of the enemy. This unprecedented war must be conducted to the final victory. Those who think of peace and wish it now are twice traitors to their country. Every honest soldier must think that way. I urge you to fulfil your duty and to valiantly defend your Russia. Obey the Provisional Government! Question 1: Study source 3 and explain what, "is inevitable in every revolution". Why does the author believe that this is such an important stage in the overthrow of a government? Question 2: How do sources 3 and 4 help to explain the causes of the problems faced by the women who appear in source 5? Question 3: Explain what is meant by the following phrases in source 6: (i) "the monarchist principle is beginning to totter"; (ii) "it is impossible to rule the country without paying attention to the voice of the people". Question 4: Select passages from this unit that help to explain why Tsar Nicholas II decided to abdicate.